I was pretty excited about dinner tonight. 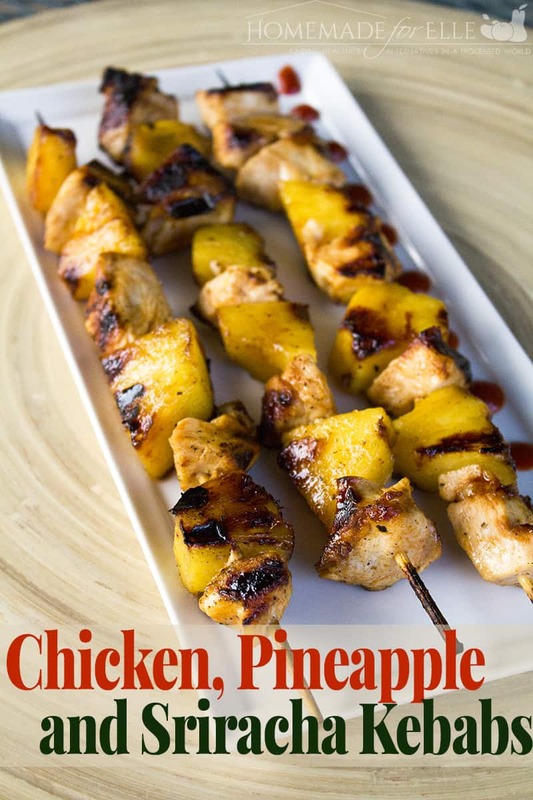 It combined two of my favorite ingredients: srircha and grilled pineapples! Seriously… have you ever had grilled pineapples before? There is something magical about them. Pineapple on its own has a bright, delightful citrusy flavor, but when it’s grilled, it transforms into a succulent, tart and almost savory treat… and it’s ridiculously good. It is definitely on my top 10 favorite foods… and I don’t say that lightly. 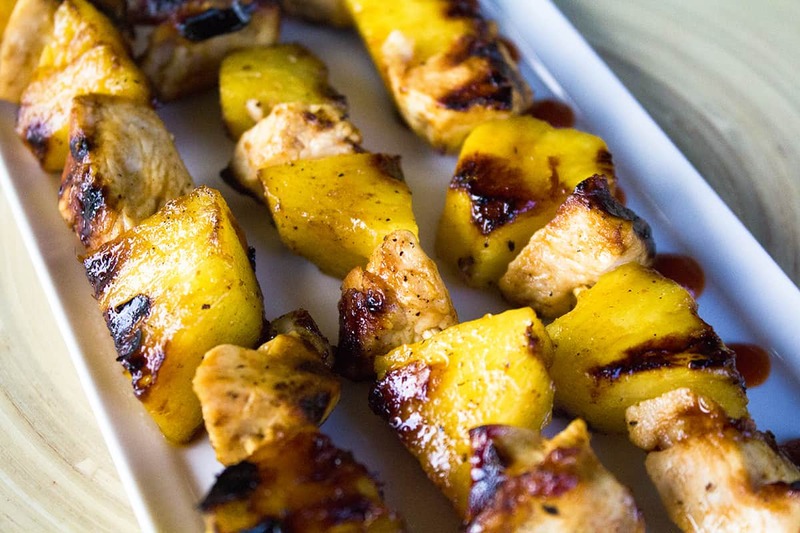 If you haven’t tried grilled pineapple, you need to do it right now. Or at least today. Or maybe this week… but do it. You owe it to yourself. I am a huge fan of sriracha chili sauce, and all things spicy, which happens to pair perfectly with pineapple flavors, in an almost Asian flavor profile. I decided to pair it with some chicken, so my hubby didn’t feel deprived (he needs meat in all of his dishes). In a small saucepan, bring the pineapple juice to a boil, and stir until reduced by half. Remove from heat, and add in olive oil and sriracha sauce. Allow to cool. Dice chicken breasts into 1″ chunks. Core the pineapple, remove the top, bottom and skin. Dice into chunks roughly the size of the chicken. Put both in a glass bowl, and pour half of the marinade on top. Marinade for 1 – 4 hours. 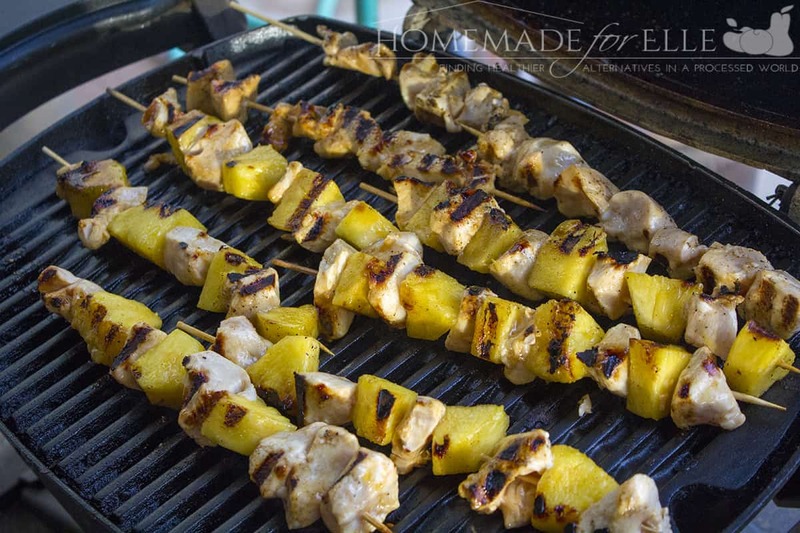 Alternate chicken and pineapple, threading it onto skewers. Warm up grill to 400 degrees. Cook Chicken, Pineapple and Sriracha Kabobs on preheated grill, basting frequently with the remaining unused marinade, until cooked through. This took about 15 minutes on our grill, but be sure to double check that your chicken is cooked through. Serve this on top of brown rice cooked in chicken broth and a side salad with a clean eating dressing.